Happy Tropical Treasures release my friends! What do you do during a snowstorm that paralyzes the city? You plan a TROPICAL THEMED Stamp of Approval release, of course! That's exactly what happened last winter here in Raleigh. We began brainstorming stamp ideas with flamingos, palm trees, tropical flowers and stamps with great textures and our illustrators went wild! They created so many incredible products and we were left with the challenge of narrowing them down to one box of products. We chose the products that were released that year and tabled the rest. I am beyond excited to say we are now releasing the rest of those fantastic tropical island-inspired products as the Tropical Treasures Collection. Be sure to visit the NEW section of the shop to see everything that is available. My two projects today were inspired by Karen, one of our StampNation Members. She threw out a color challenge on our Facebook Page last weekend and I took her up on it! 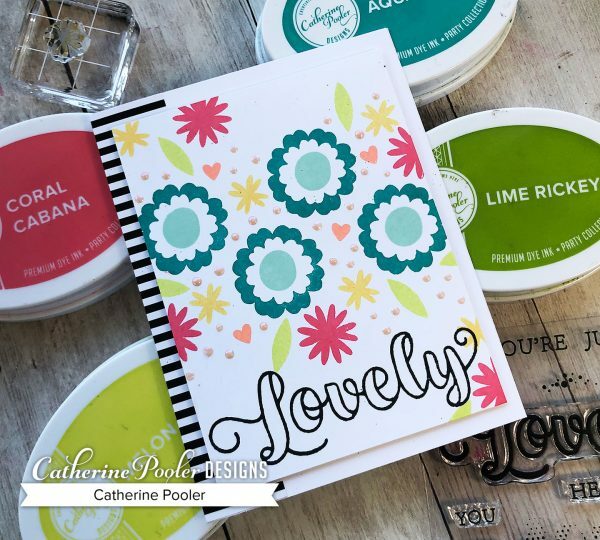 I used Mint to Be and Aquatini to stamp “Lovely” from the Isn't She Lovely Stamp Set, stamped flowers from the Be Wild Stamp Set on the bottom and used the Direct to Paper technique to color my white cardstock a gorgeous Melon Ice! 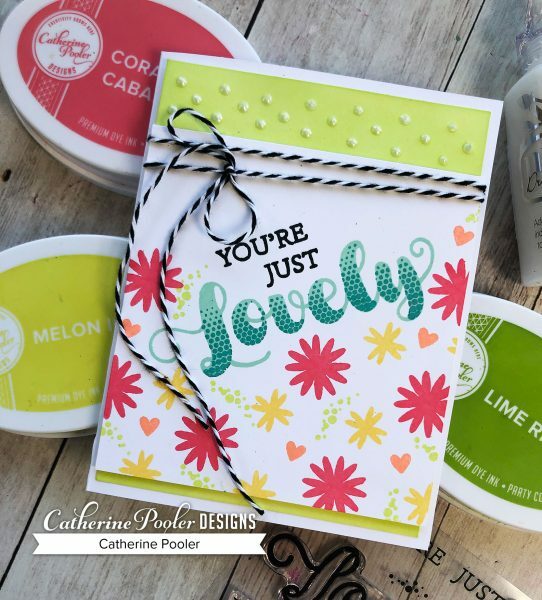 I layered the cardstock, wrapped around some twine and added Nuvo Drops to the Melon Ice Cardstock. We love to live stream with our SN Members, so during their Early Ordering period for this release we went live and I made this card. I love the results! The next card was made with the same color palette. It's SO bright and cheerful! I added a strip of Black Tie Gala patterned paper to the edge and called it a day! With all of our releases, we are having a blog hop! I can't wait to check out all the projects on our incredibly talented teams' blogs. Here is the all-star line-up! Catherine – you are here! Jen Carter – go here next! Be sure to comment on the blogs, the more comments you leave, the better chance you have at winning a $25 gift certificate to the shop. Good luck!